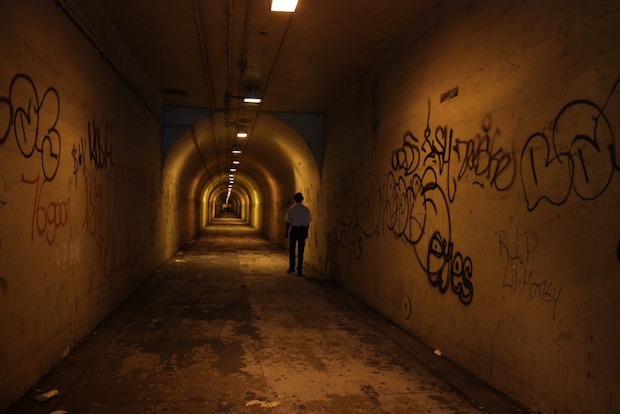 WASHINGTON HEIGHTS — Locals are fed up with filthy, dark and dangerous conditions in an underground tunnel that connects the 191st Street 1 train subway station at St. Nicholas Avenue to Broadway — but say their complaints to city agencies only lead to bureaucratic finger-pointing. Phyllis Seeman, 59, of Queens, walks through the tunnel several times a week to bring her grandson home to his mother, who lives near the end of the corridor at Broadway near Fairview Avenue. But she said the corridor is so disgusting and dark that she'd often rather stay over at her daughter's house than walk back to the train alone. “There should really be a security person there. At the very least, it should be better lit and there should be a phone in case someone needs help,” said Seeman, who has called 311 and the MTA to report the conditions, but was told that the agency is not responsible for maintaining the space. A visit to the tunnel on a recent morning revealed large areas that were flooded, piles of trash that included a car tire, graffiti, and what appeared to be mold growing in one area. Additionally, more than a dozen cyclists sped through the tunnel during a half-hour stretch. Moreover, the stairway at the tunnel's entrance is currently closed for repairs, leaving pedestrians to navigate a steep and uneven ramp to access the corridor. An MTA spokesman said that they are not responsible for the tunnel's maintenance because it's considered a street, not a subway entrance, noting the passageway is the Department of Transportation's responsibility. A DOT spokesperson said the Department of Sanitation is responsible for cleaning the space. The DOT sent its own inspectors to visit the site as recently as May and did not find any problems with the lighting, they said. The department did not comment on the problem with bike-riding in the tunnel. A spokesman from the Sanitation Department said the space is cleaned on a weekly basis, adding he was not aware of any issues with mold. Locals said they've had it with the red tape. The tunnel is one of the few options for residents who need to access the 1 train from that side of the neighborhood. The other routes involve walking up a large hill or using a secluded set of stairs in Gorman Park. Locals said the space has long been allowed to fall through the cracks. Pena, a security guard who has lived in the neighborhood for five years, also noted that the station is “creepy at night” because the lighting is dim and bulbs are often burnt out, leaving large areas in darkness. Other residents said that bikers who frequently ride through the tunnel pose a danger to people walking through the passageway. Amy Macdonald, 36, said she won’t allow her 21-month old son to walk through the underground stretch because of the cyclists. “It’s unsafe," she said. "It’s often young kids who don’t seem to care who is in the way." A sign at the entrance warning cyclists not to ride through the tunnel disappeared about a month ago and has not been replaced, residents said.